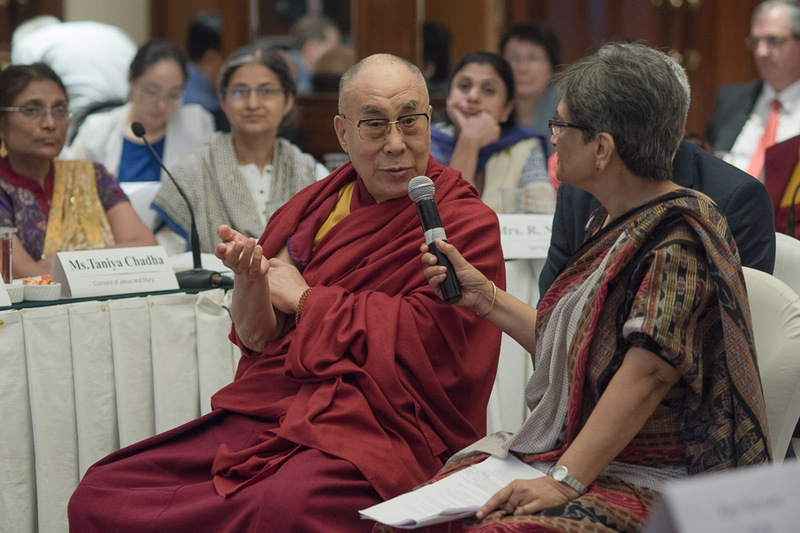 (TibetanReview.net, Apr09, 2016) – Tibet’s exiled spiritual leader, the Dalai Lama, on Apr 7 took part in a discussion in New Delhi on a draft text meant to introduce secular ethics as a subject in modern education. The draft text, ‘Secular Ethics in Education’, was prepared by Emory University. Geshe Lobsang Tenzin Negi, PhD; Jennifer Knox; and Michael Romano, PhD from Emory University, gave their presentations on the draft text to a gathering of around 50 educationists and academics, mostly from Indian schools and universities. The discussion was held at the Hotel Sheraton and organized by the Gaden Phodrang, the office of the Dalai Lama. Prof Meenakshi Thapan introduced the occasion, recalling that the Dalai Lama had emphasized the importance of warm-heartedness in education and stated that compassion was a core educational ideal. She noted that his stressing a secular approach was particularly attractive. Ven Tenzin Priyadarshi spoke about the work of the Dalai Lama Center for Compassion at MIT and the potential for use of technological tools, gaming and apps. He remarked that we don’t want so much to teach values as to teach with values. And on behalf of the New Delhi-based Foundation for Universal Responsibility, Mr Rajiv Mehrotra described projects to cultivate peace within and without – peace building, non-violence and co-existence, as well as ethics and education. The Dalai Lama responded by saying he wished to see the Foundation extend the scope of its activities to other parts of India and neighbouring countries. During the concluding discussion, Geshe Lobsang Tenzin pointed out that the material for the curriculum had largely been drawn from the Dalai Lama’s work such as ‘Ethics for a New Millennium’ and ‘Beyond Religion’.